The second-closest DiCarlo's to my home is the Follansbee location. 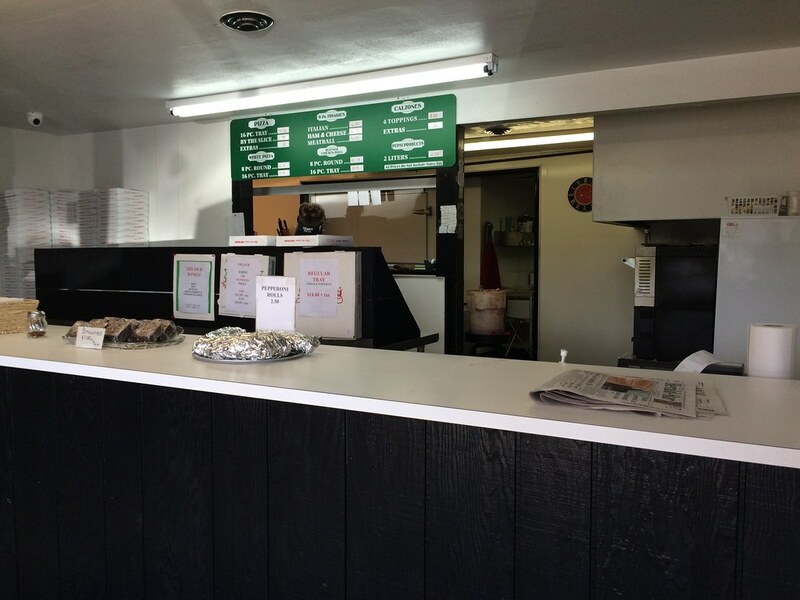 Located in Hooverson Heights, DiCarlo's is open daily and serves the pizza I love so much, as well as oven-baked hoagies, calzones, wings, pepperoni rolls, and specialty pizzas (like buffalo and white). This location has pieces for just .90. I ordered 5 regular for me and 5 without pepperoni for my parents. I waited for maybe a half hour or so, as there were a few people in front of me. And those poor workers must be dying because it was blazing in there. But it was all worth it when I was handed a square box full of Italian gold. When I got home and opened the box, the shreds of cheese had melted from the steamed box. One of the best parts about DiCarlo's Pizza is the cold provolone atop the hot sauced pizza. But if you wait too long, it melts just like the other regular plebe pizzas. I noticed there is a good bit less cheese on these cuts than some of the other DiCarlo's locations. But it was enough. 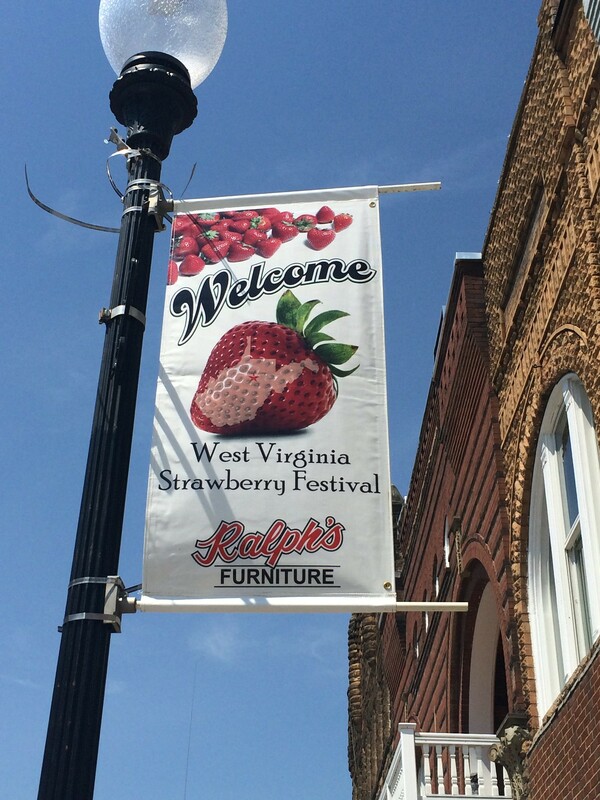 The sauce was not quite as flavorful as, say, Wellsburg's. It's still delicious, but if I have to compare to other locations, I think it could use a little more seasoning. The crust was thin and crisper. Other locations tend to be thicker, but this one was definitely on the thinner side. 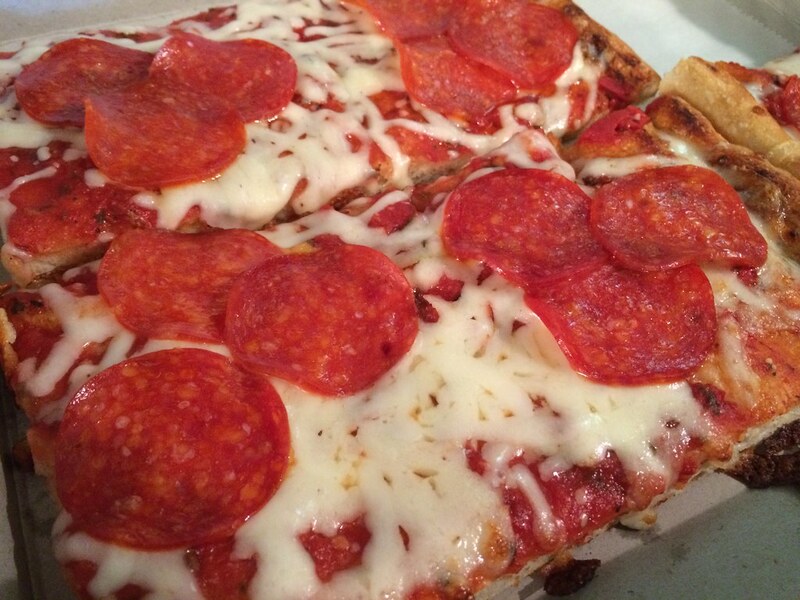 It's no secret I love DiCarlo's Pizza, and Follansbee's location is no different. Is it my preferred? No. 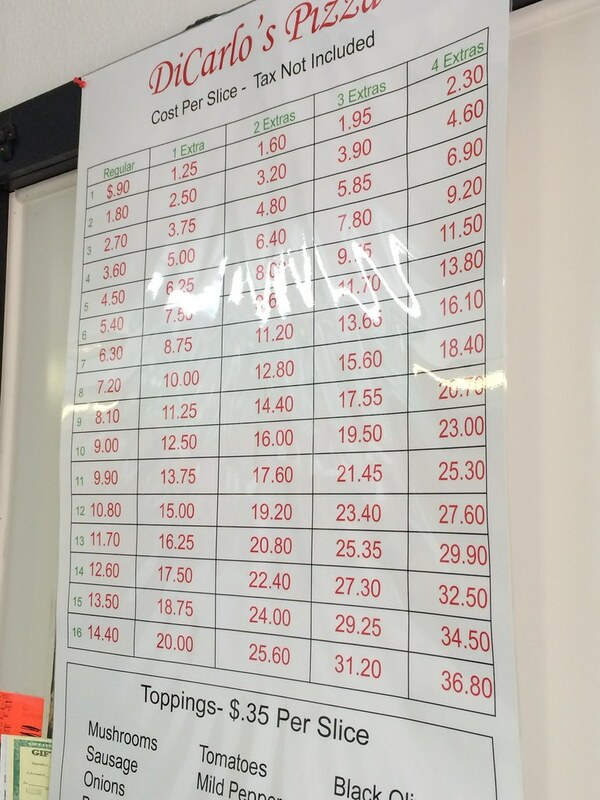 It isn't as good as Wellsburg's, but it is close and has better hours. 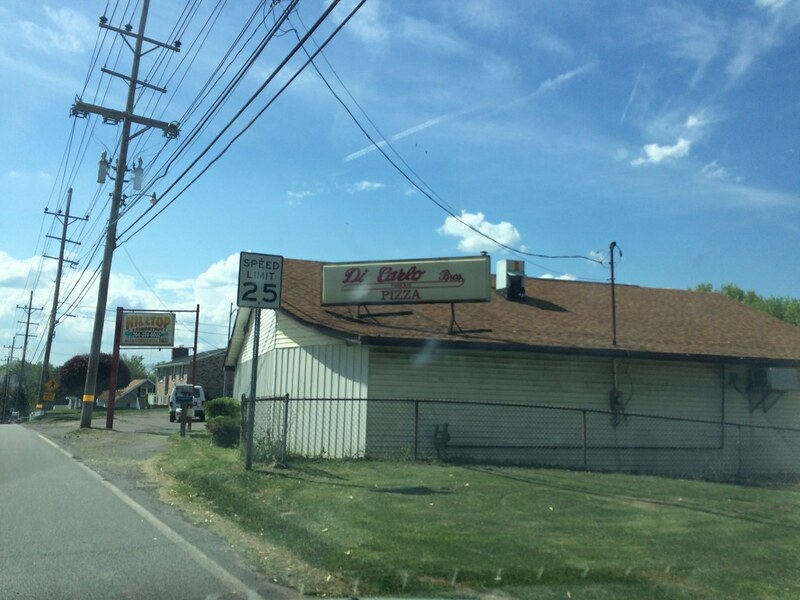 And, nothing beats DiCarlo's - except the Wellsburg DiCarlo's. As we were coming back from Buckhannon, my friend Kayla mentioned there was this great hotdog place along the route we were traveling home. 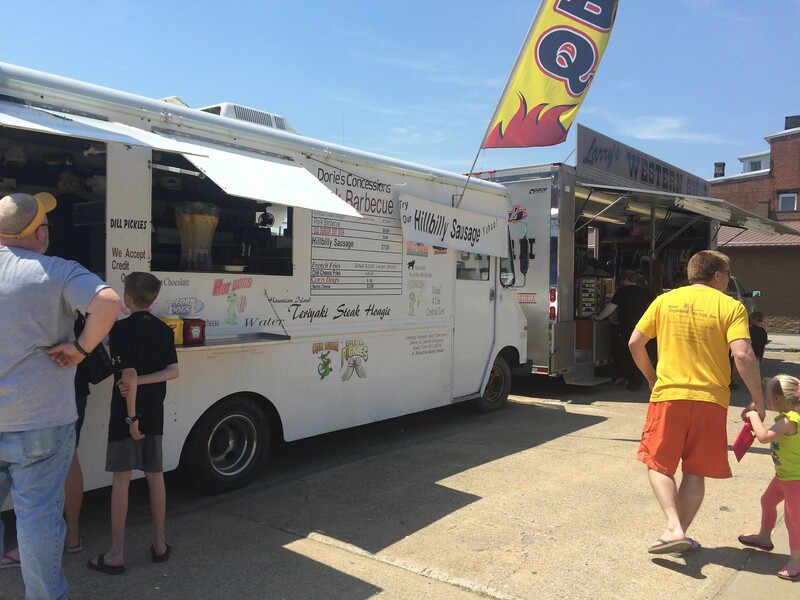 It is near Belington and has more than 250 hotdogs. What? 250 hotdogs? How? 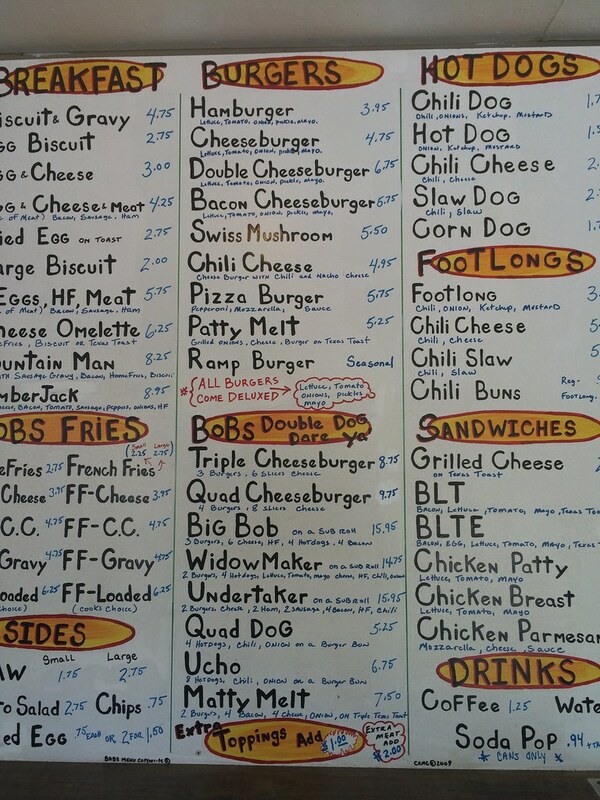 The three of us made a quick detour to Norton to Bob's Hotdogs. It's right off the exit and just off the road. 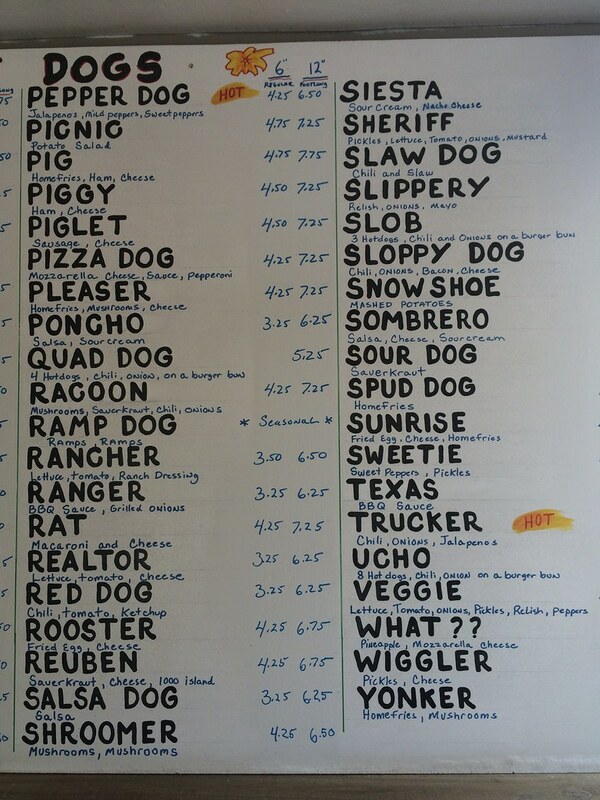 The hotdog shack has boards all around the building boasting the various hotdogs, as well as breakfast, burgers and fries. 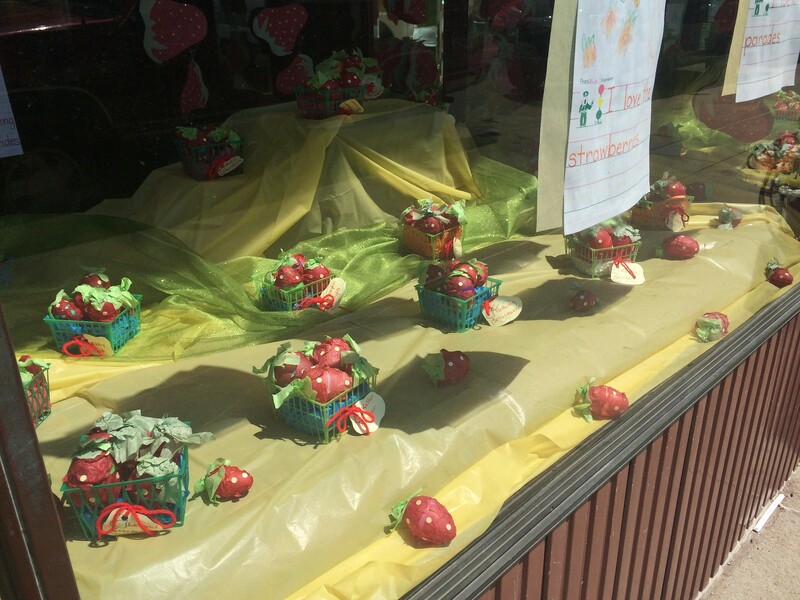 We rolled up to the window, and I tried to "quickly" browse the menu. I was a little too excited. I went over to the counter to order a "Nurse," with mashed potatoes and cheese. I barely was able to get the words out of my mouth before the woman at the window said I can't have anything with mashed potatoes. Oh, OK. She then goes on to say they make everything from scratch each morning and when they run out, they run out. OK, got it, no problem. I'll order something else. But it was almost like she was offended I asked for mashed potatoes that late in the day (two hours before they close). Really, no problem, just let me find something else. So I asked if I can do macaroni and cheese with the "Rat," and she called back to the kitchen and they said yes. She continued to lecture me on how they make everything fresh each day. I think a simple "sorry, we're out of that" would have sufficed. I was just happy once I had my hotdog and headed home. When I opened the container, it just looked like a ton of macaroni and cheese dumped on top of a hotdog, maybe. There is a hotdog under there, promise. 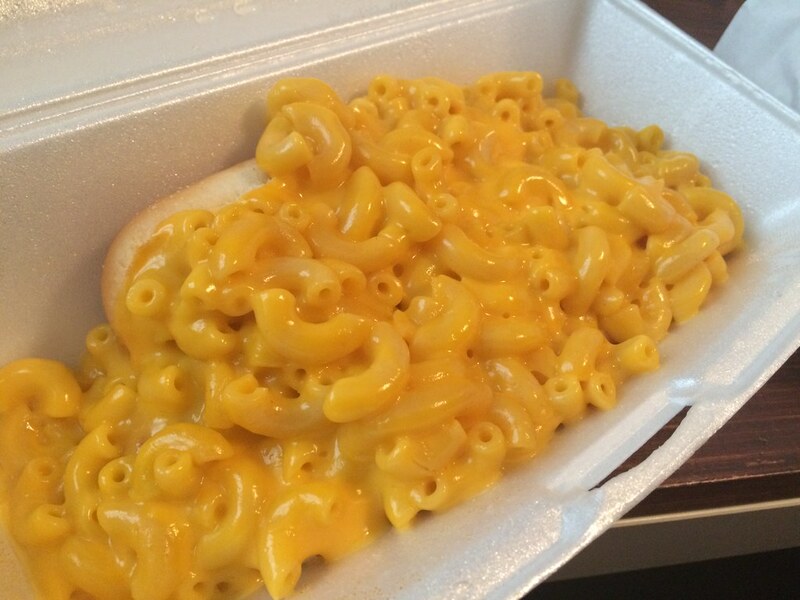 But the macaroni and cheese is less of a topping and more of just a couple cups thrown on top of a hotdog in a bun. 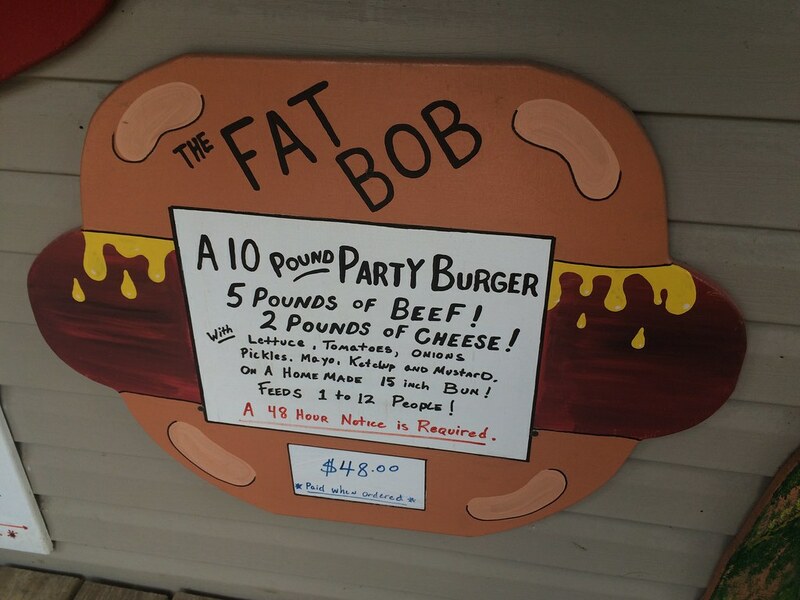 The macaroni and cheese itself is OK, and the hotdog/bun were OK, too. It probably didn't help that it steamed itself a bit on the container on the drive home. 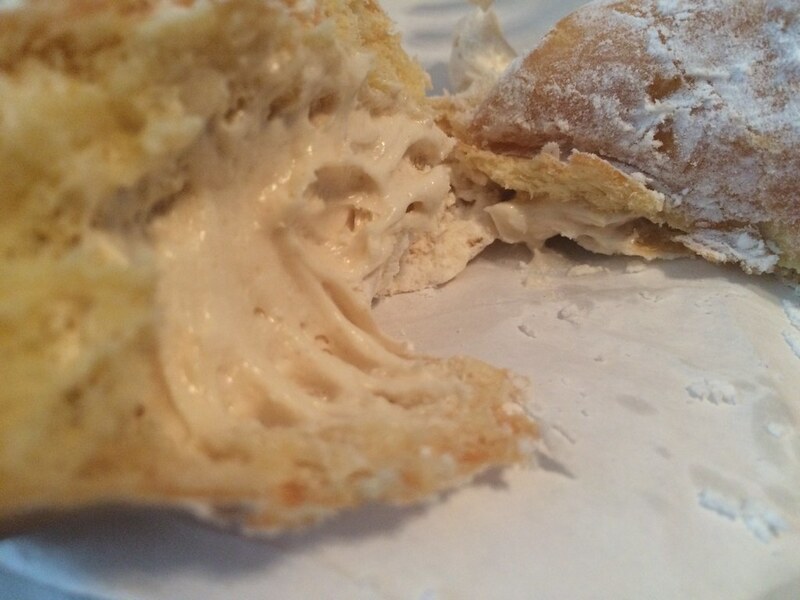 The macaroni was a little dry - a bit creamier would have been tastier, but also would've soaked the bun, probably. So that's a tradeoff. I also think it's funny to have that much macaroni and cheese, but I was really thinking it would be more fo a topping - instead of needing a knife and fork. 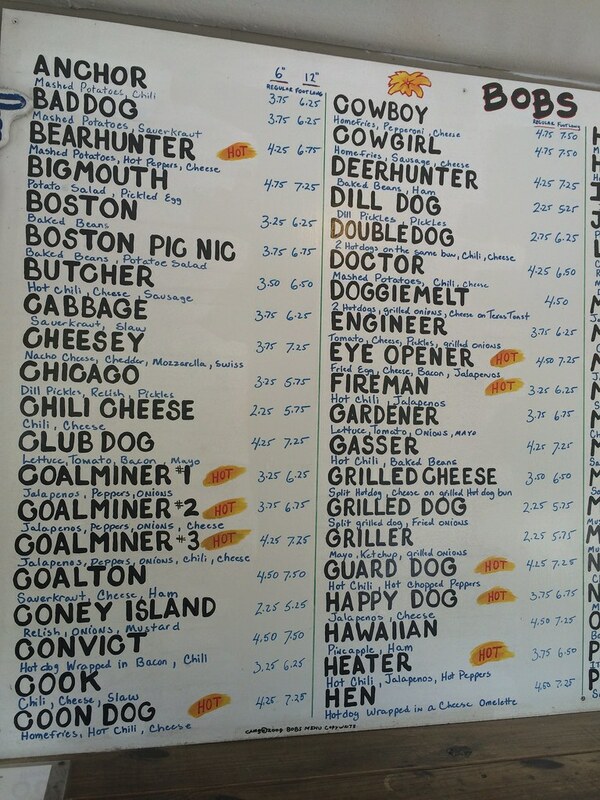 I think the coolest thing about this place is the novelty that there are THIS many kinds of hotdogs they offer! 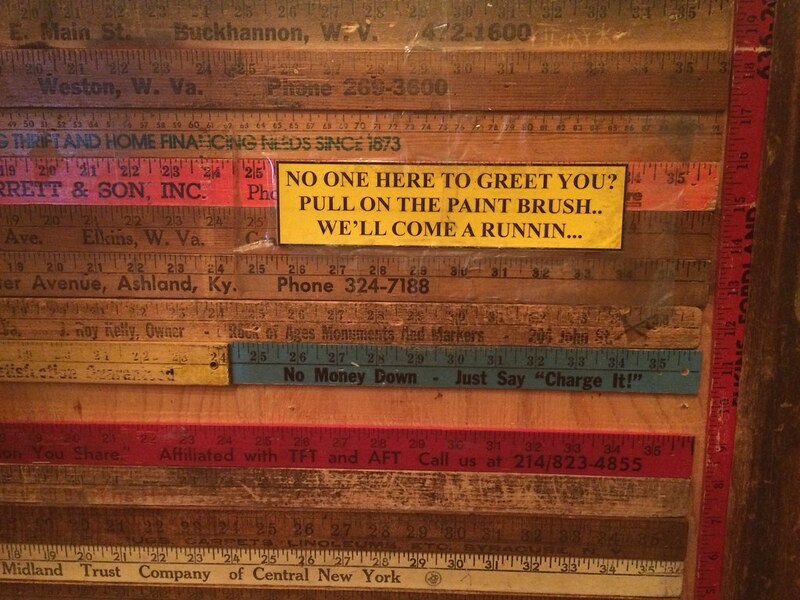 Such a neat little find in West Virginia. 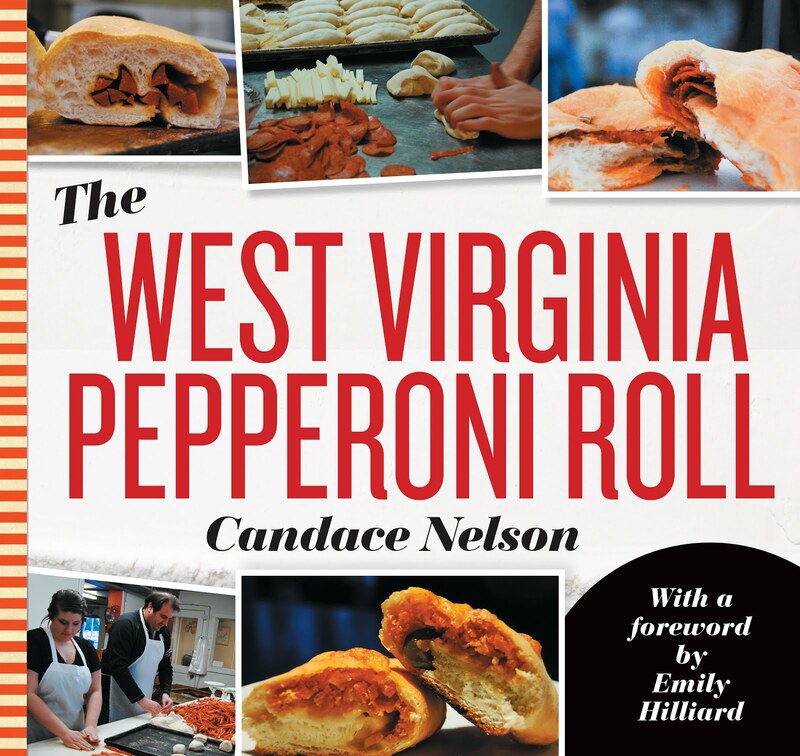 I visited The Donut Shop in Buckhannon to learn about pepperoni rolls (you'll be seeing that a lot from some of my blog posts), and I had to try some of the donuts, too. 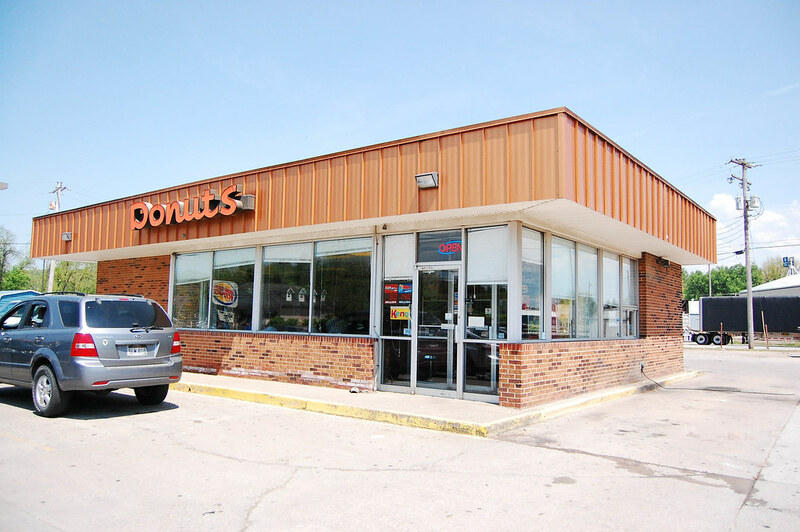 The manager told me they have around 40-50 donuts. YUM. They're open 24 hours and have a small dining area inside. They serve pepperoni rolls with ground pepperoni. Yummy! 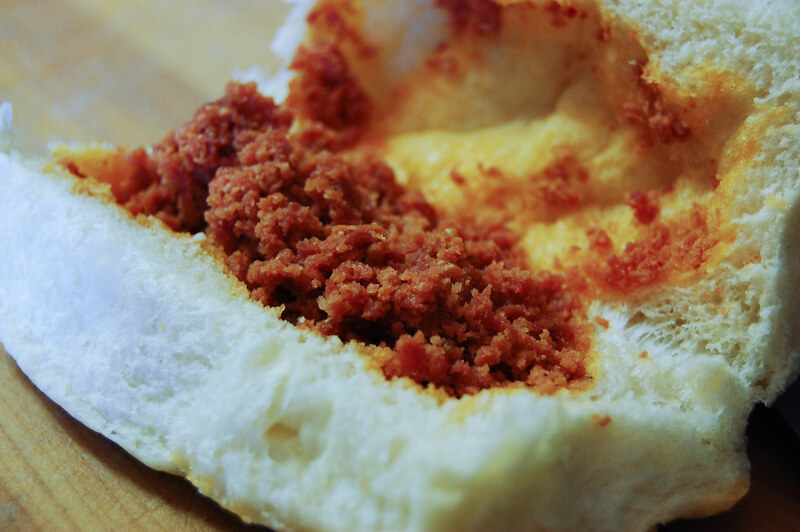 It's a roll with ground pepperoni right inside, so there are little bits everywhere. 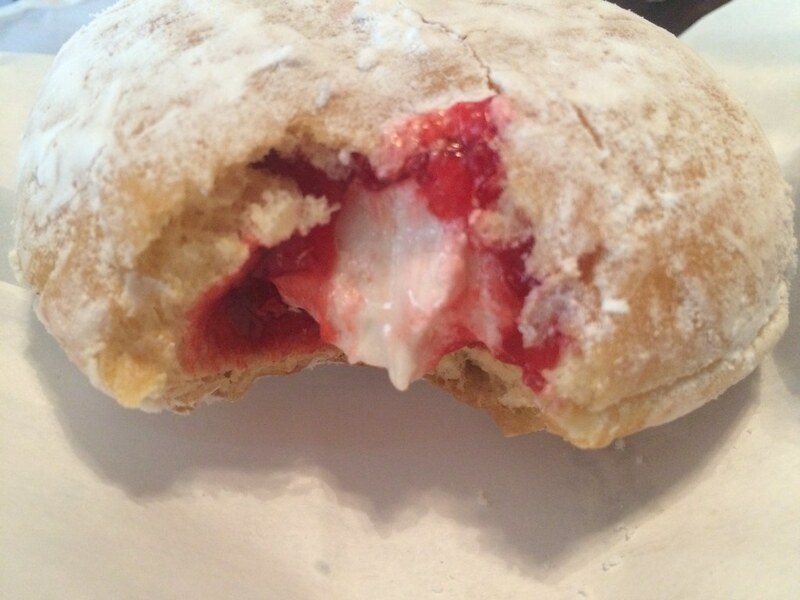 I got a strawberry shortcake donut, which was delicious with strawberry and cream filling. I also got a peanut butter angel, I think it was. It was so good! Peanut butter and cream. Good lord. 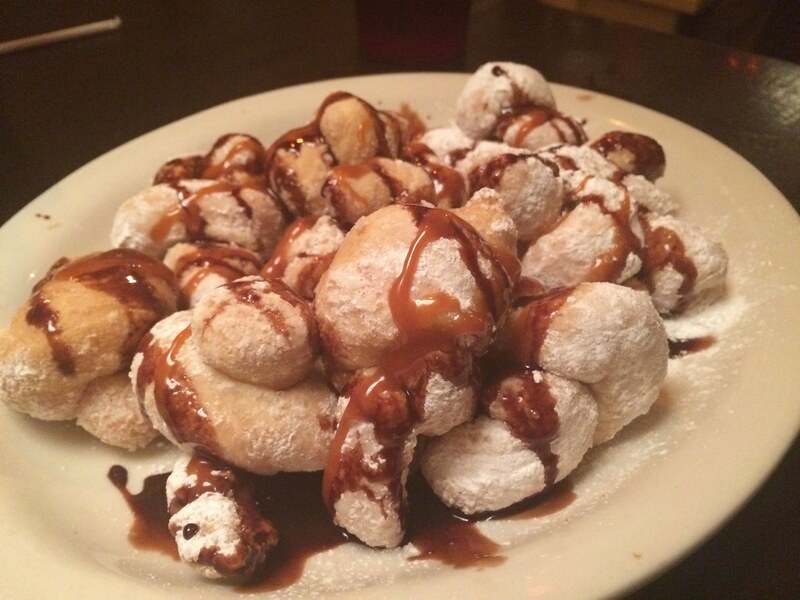 Do yourself a favor and just get a dozen to go - along with a pepperoni roll. I went to the C.J. 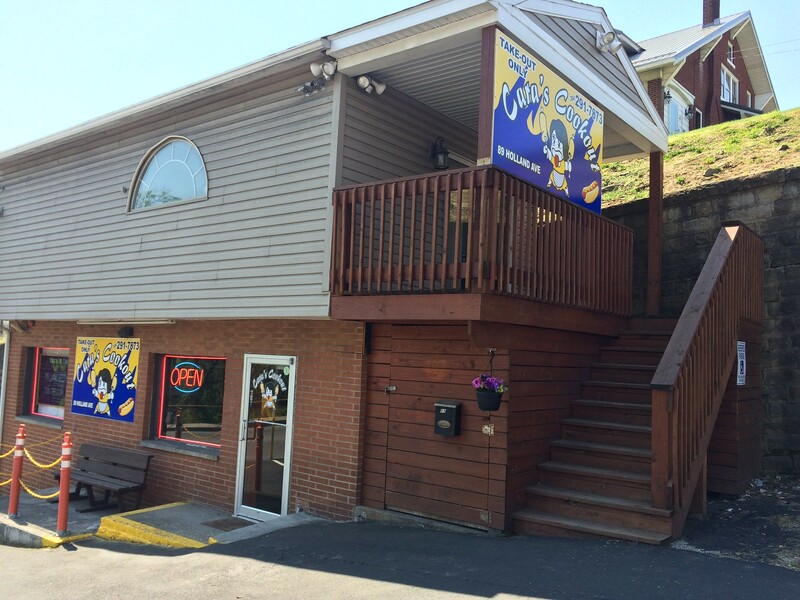 Maggie's location in Fairmont a few years ago when it was still around, and I have fond memories of a giant spinach salad - peanuts, egg, tomatoes, mozzarella and hot bacon dressing. Yum. C.J. 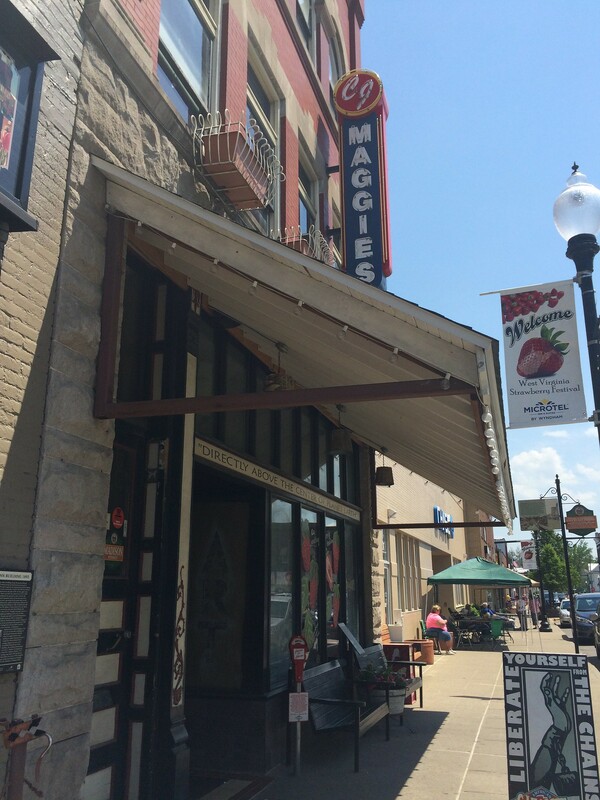 Maggie's, which has opened a few restaurants in West Virginia, is well beloved in the state. A Morgantown one was even more short-lived than Fairmont. Now, only two C.J. 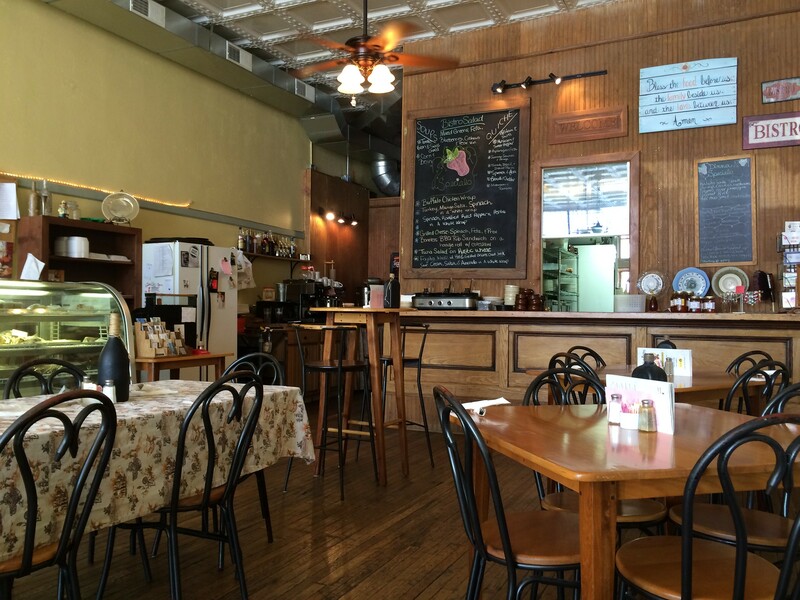 Maggie's remain: Elkins and Buckhannon, the original. C.J. 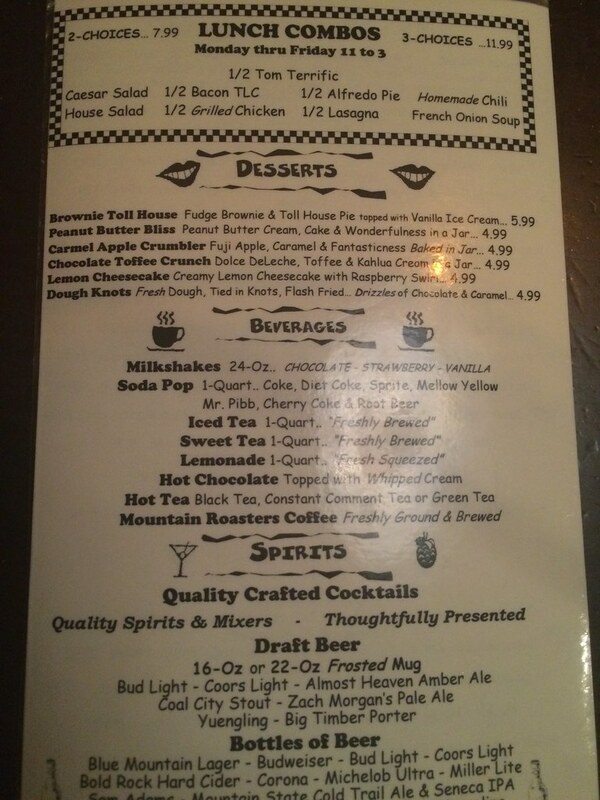 Maggie's boasts a huge menu from wings and fries as appetizers to seven salads with a choice of nine dressings. 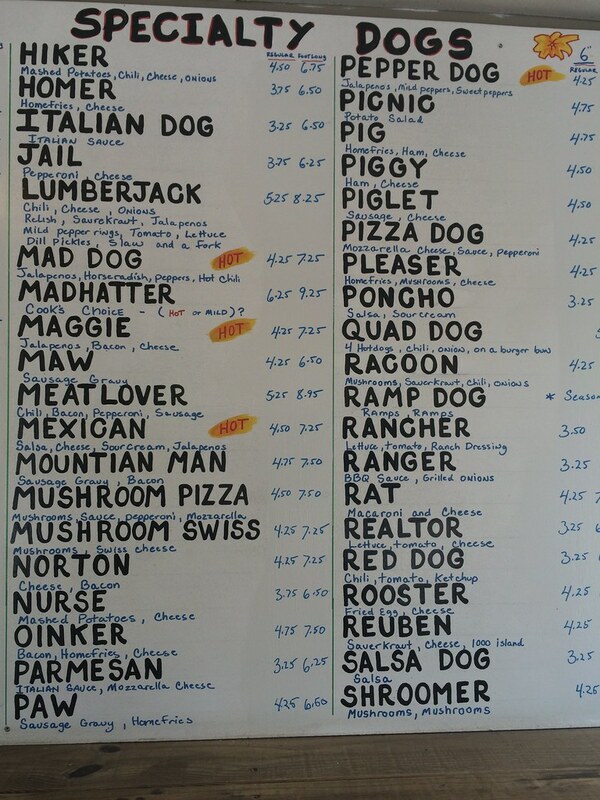 There are more than a dozen wood-fired pizza choices, like a spinach ricotta and roasted garlic, and a grape ape. Then there's the meat section with steak, roast beef, chicken and biscuits, Italian sausage platters, stuffed pork chops, fish and pulled pork. 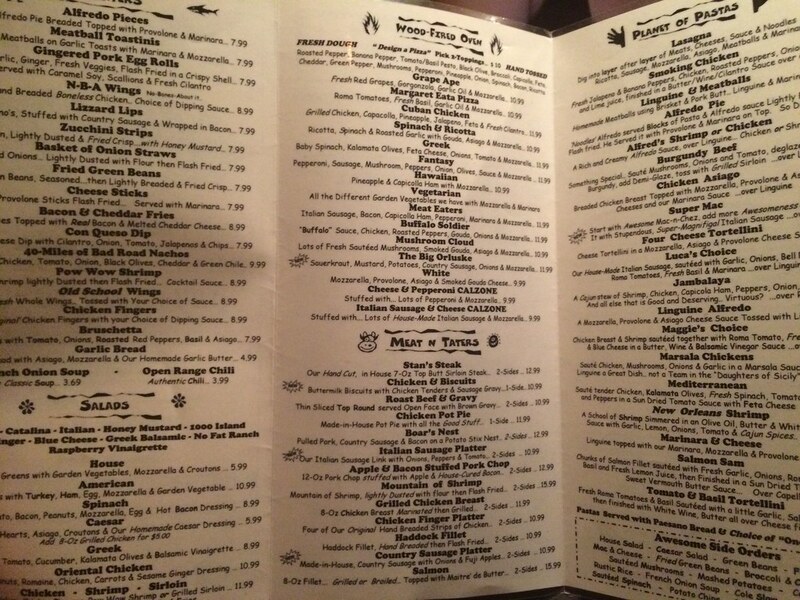 Then, there are nearly 20 options for pasta - lasagna, linguine and meatballs, alfredo pie, burgundy beef, chicken asiago, super mac, tortellini, jambalaya, marsala chicken and more. 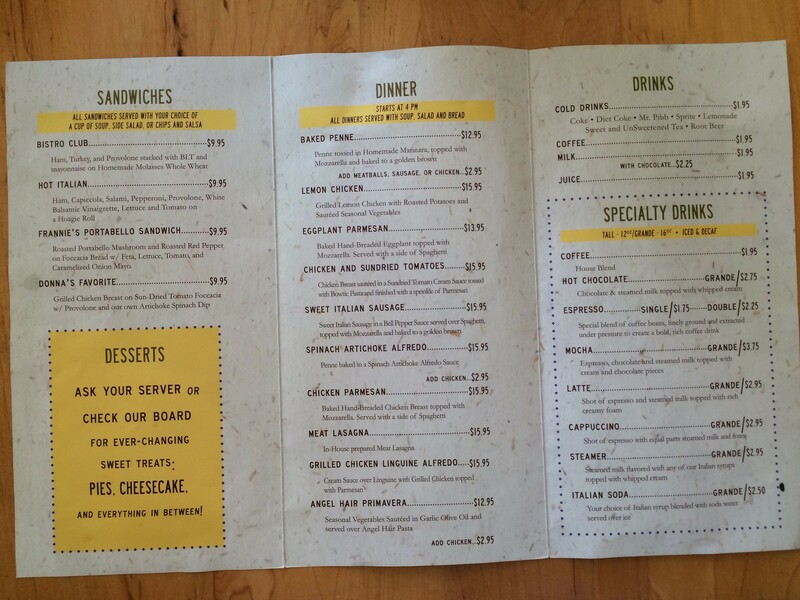 Plus side orders, plus tex mex, plus 22 sandwiches - club, buffalo chicken, burgers, Italian hoagies, reubens. But we actually didn't go there for any of that. 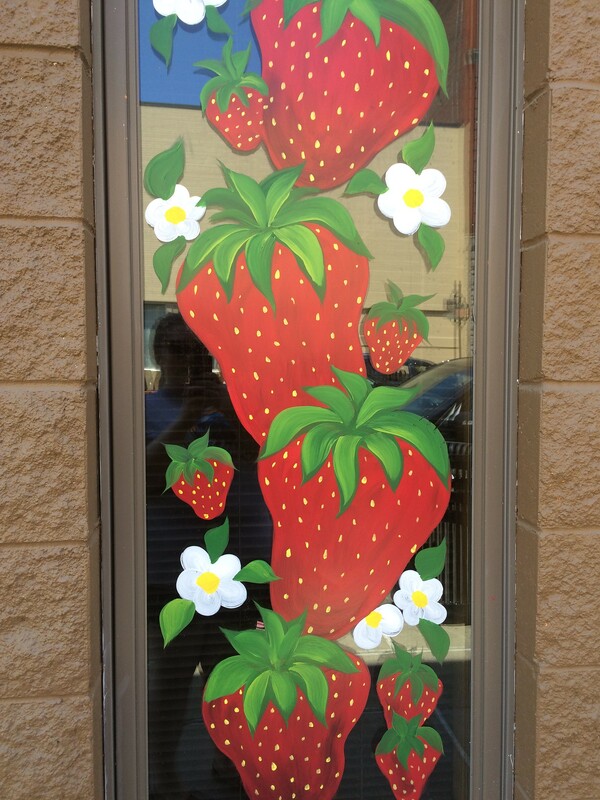 I just wanted something with strawberries in honor of the Strawberry Festival, so I ordered a strawberry shake. That is, once we were finally waited on - about 15 minutes after we sat down. That was odd since we were seated immediately. They didn't seem too busy. Then, it took about another half hour before I received my strawberry shake and the order of dough-knots that a friend ordered. The service was not great. 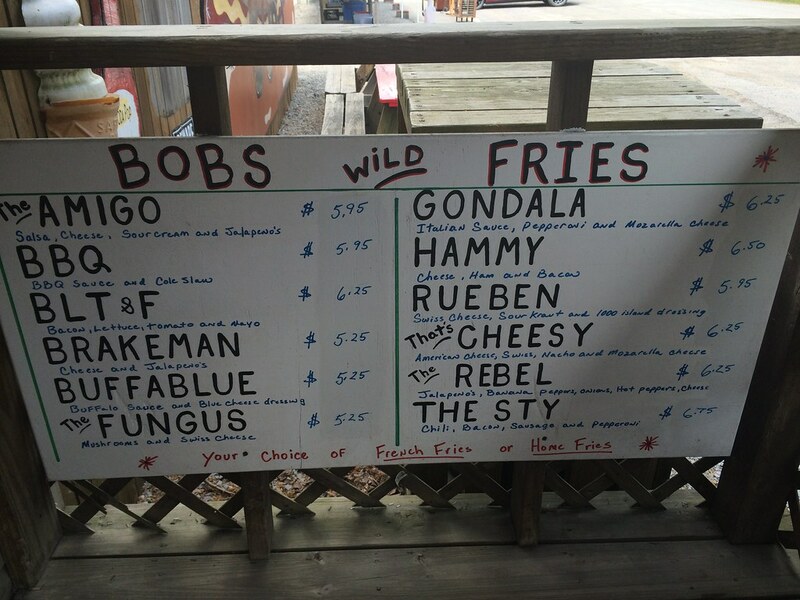 It took about an hour total for a simple shake and an order of flash-fried dough. We had another appointment scheduled, and I didn't want to be late. I think our waitress knew the wait was too much, because she brought out our drinks in to-go cups without even asking. 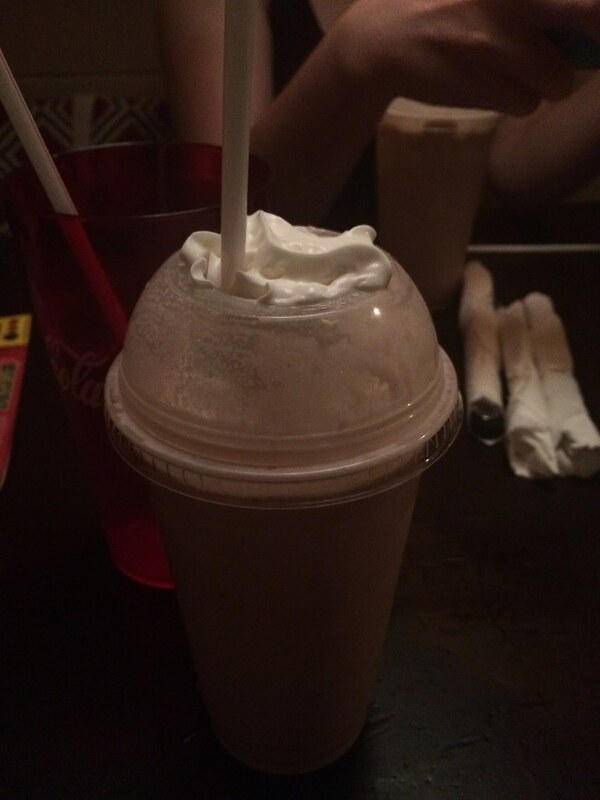 The good: This damn milkshake was delicious. I know you're really surprised that I was impressed with ice cream. But there was some chunks of strawberry, and the whipped cream. Yum. The dough knots were also good - if you love donuts. I had one, and it was super sweet between the sugar, the chocolate syrup AND the caramel. The bad: The experience here was a mess. I wish it wasn't, but it was. We were seated almost immediately, but it took 15 minutes for our server to arrive. Then another half hour to receive our food (which shouldn't take that long), then another 15 or so minutes to bring our cards back once we paid. The whole experience was kind of ruined because it was rushed and just not fun. And there were empty tables all around. So, I'd go back again for a meal. And just hope the experience is better. 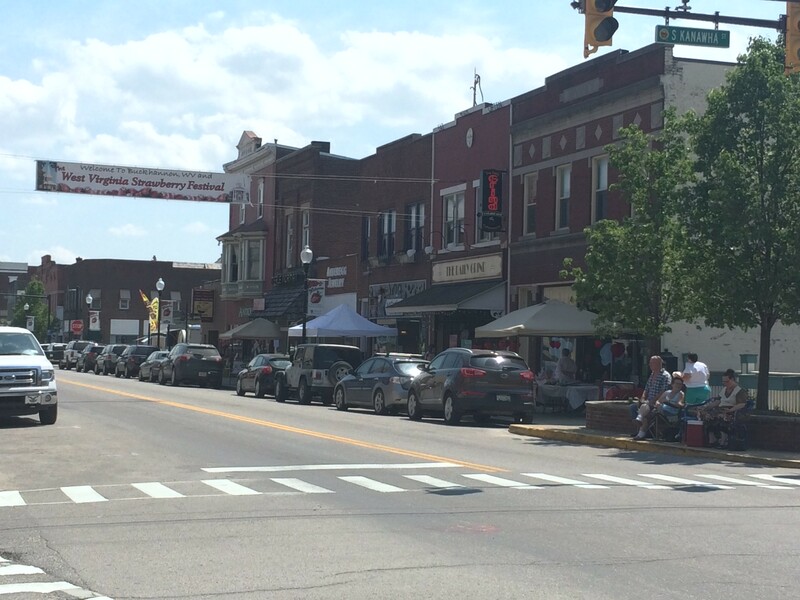 Buckhannon is such a cute little town with some delicious restaurants options. 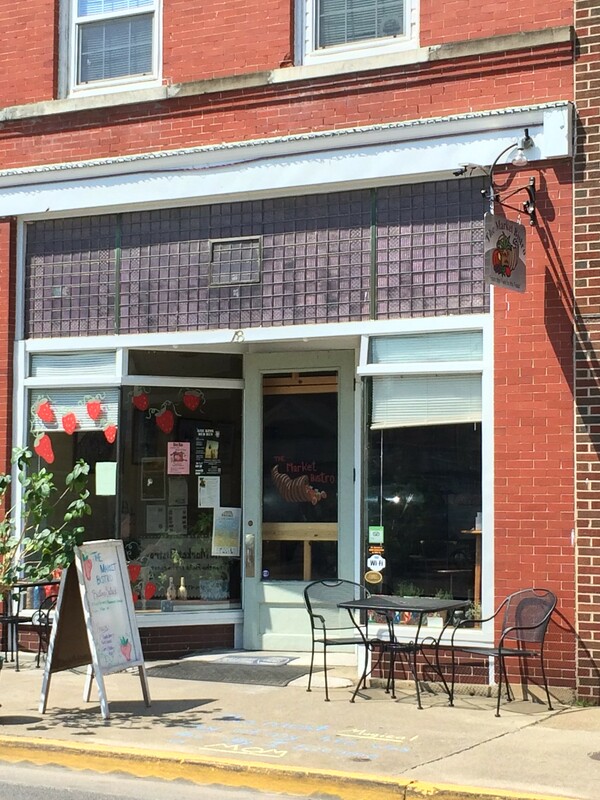 As soon as we got to town, we beelined to the Market Bistro, a charming little cafe with soups, sandwiches, salads with homemade dressings, quiche and loads of desserts. 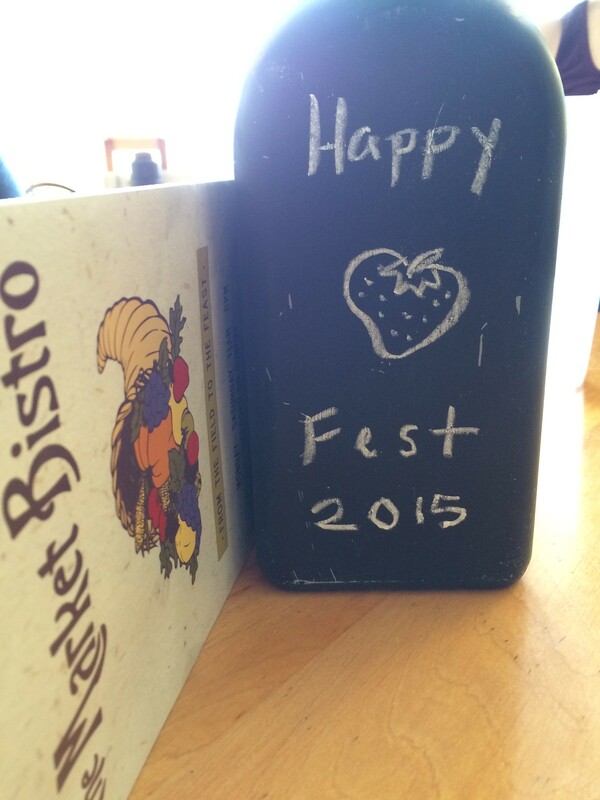 The inside of the Market Bistro is cute and eclectic with some floral tablecloths and chalkboard painted bottles. 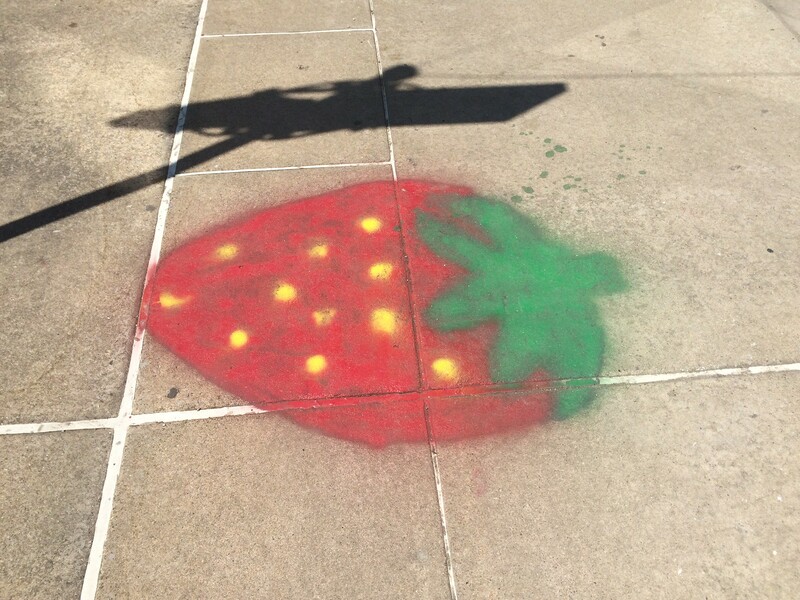 My friend Kayla created that beautiful "Strawberry Fest" art. There wasn't another soul in the restaurant, besides the workers when we went, which I found odd for a Saturday around lunch time. Maybe we were a bit too early. We seated ourselves and looked through the menu. 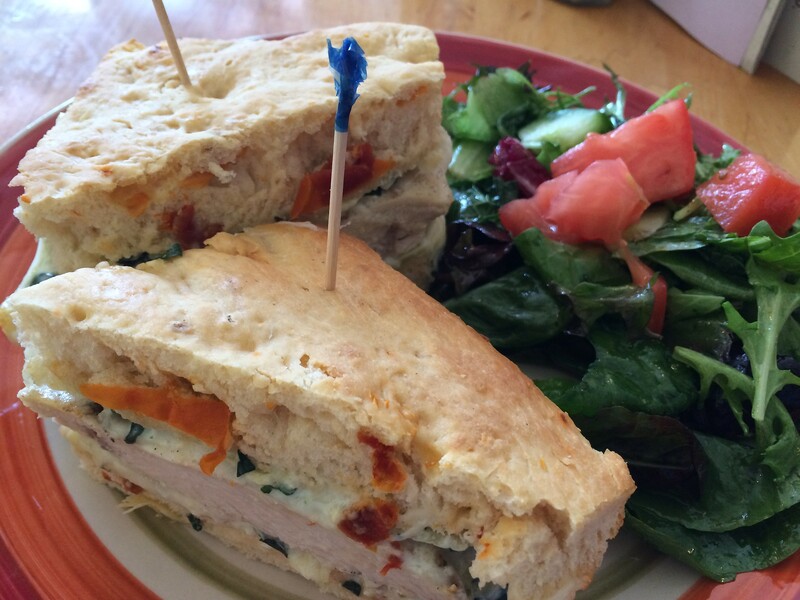 There's a club sandwich, a hot Italian sandwich, a portabello sandwich and "Donna's Favorite," which was a grilled chicken breast on sun-dried tomato foccaccia with provolone and artichoke spinach dip. There is also a variety of dinners, like baked penne, lemon chicken, eggplant parmesan, lasagna, alfredo, etc. For our lunch, I went with the Donna's Favorite and a house salad with maple bacon dressing. After a little wait, our plates arrived. My sandwich was an impressive display piled high with thick triangular cuts of bread. The bread is phenomenal - fresh, crumbly in all the right places, golden brown and super flavorful. The artichoke spinach dip was also tasty, but the chicken was not doing it for me. It was maybe precooked and then microwaved? Or maybe just microwaved? 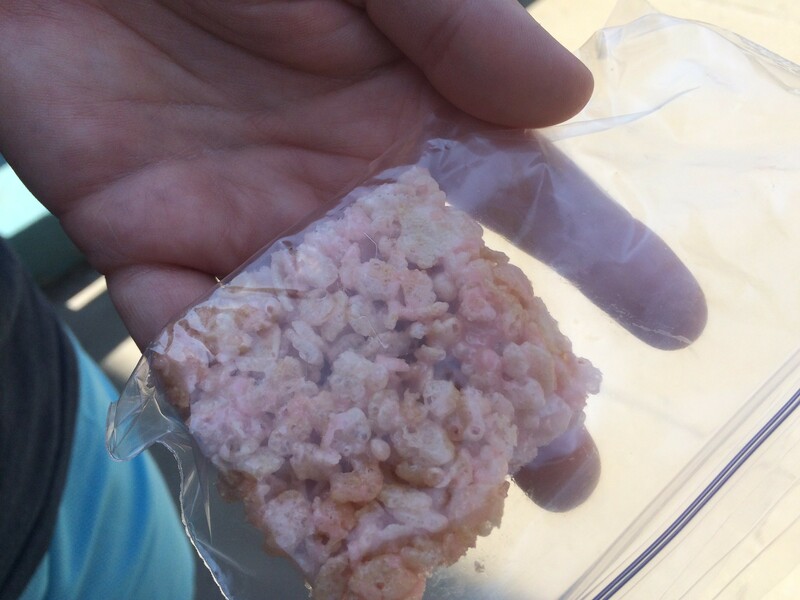 It was rubbery and dry and lacked flavor. I was a little bummed, but I honestly ended up just picking at the bread and dip because they were both so good. The salad wasn't bad, either, and the dressing was much more on the maple side than the bacon side, leaving me with a sweeter flavor. All in all, a very cute little restaurant, and I really loved the bread and dip, but the chicken needed some work. It's an easy fix - but also an important one. Otherwise, I think their dinner also looks really good, and I'd love to try that if I'm back in the area sometime. And that dessert case - good lord, it looked delicious. But were were saving room for our snacks throughout the day, so I didn't want to get stuff at the first place. Next time. 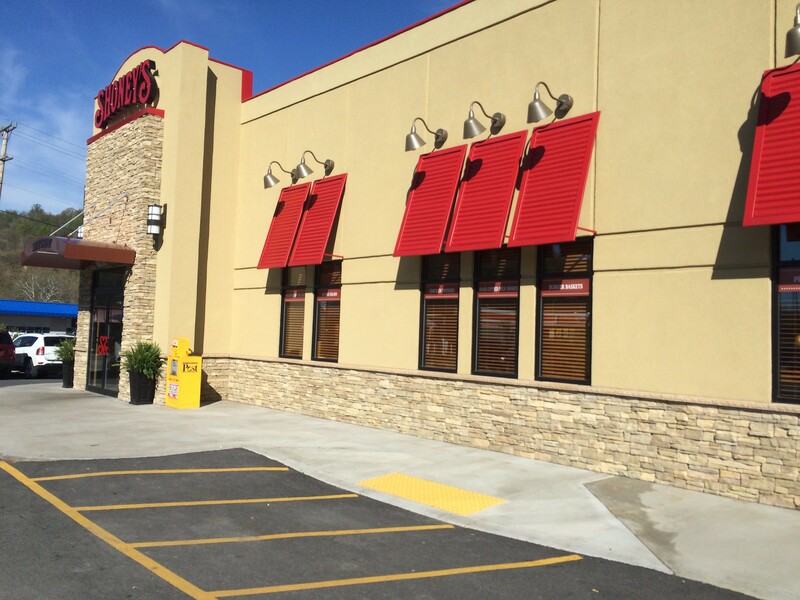 I've mentioned that the Shoney's in Morgantown recently moved to Sabraton and now includes alcohol. I wasn't sure I would visit, so I wanted to post a small blurb. But, hey, I visited! A friend was in town, and we needed a quick breakfast. And this is what happened. I won't go on - you know the drill. 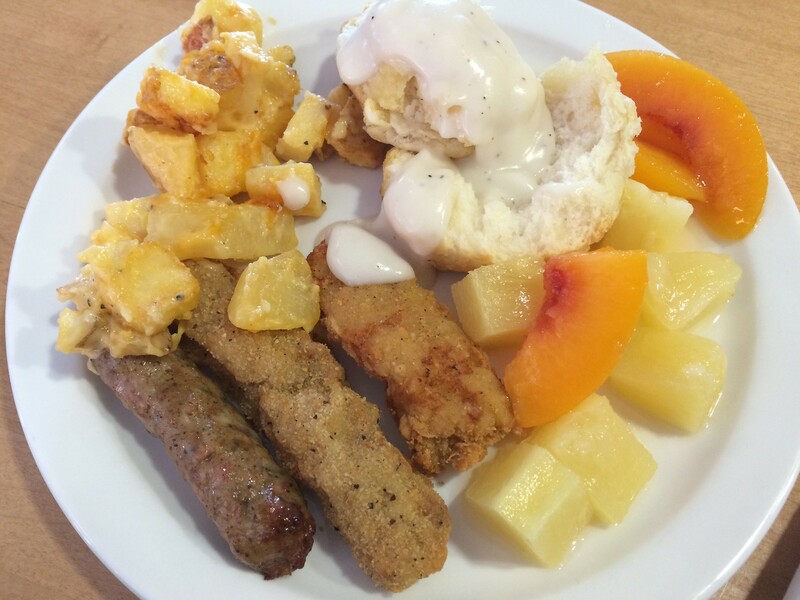 The breakfast buffet has some fruit, some potatoes, eggs, bacon/sausage and biscuits. The quality? Average. Nothing mind-blowing ... though I didn't hate those cheesy potatoes. 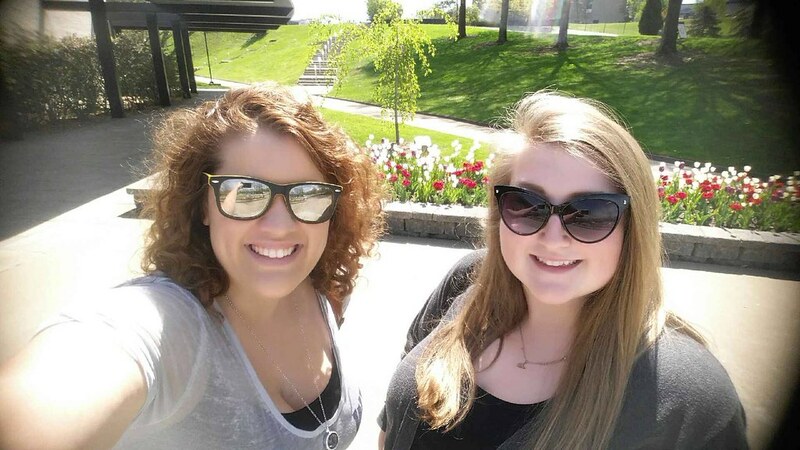 The best part, though, was time with one of my favorites! 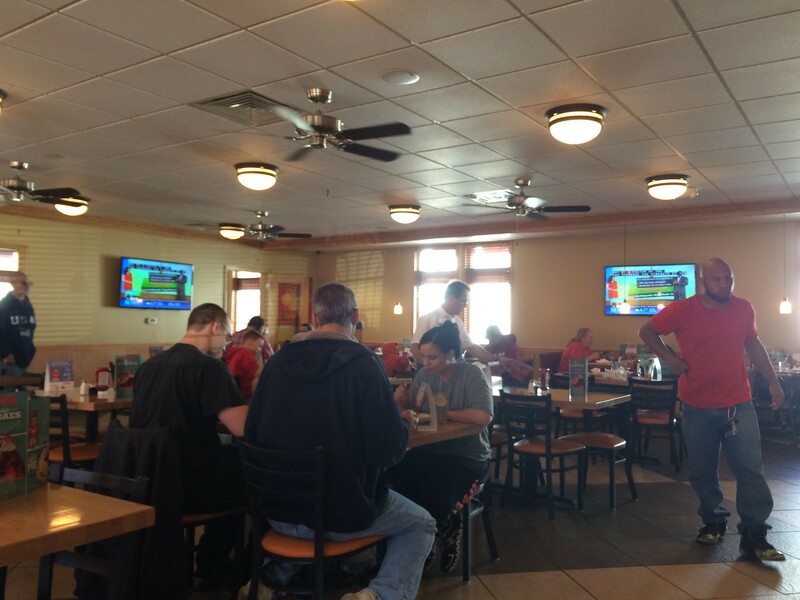 A new takeout restaurant has opened in Westover in a former used car lot space. You know when you cross the bridge into Westover and follow up toward the hill toward the right? That awkward space to the left? That's the location of Cara's Cookout. It's an awkward location, but it's pretty easy to loop in and out at least - which is nice for a takeout place. 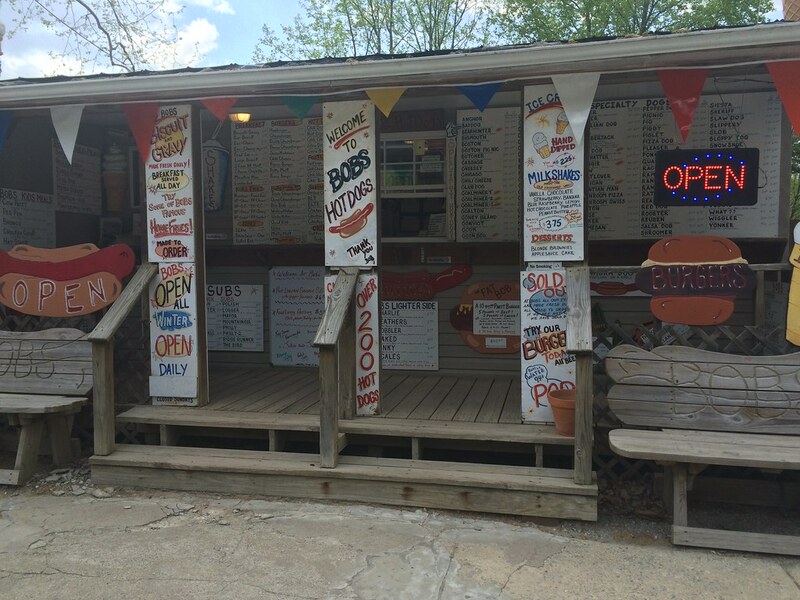 Cara's Cookout has a very small menu with just hotdogs and packaged pepperoni rolls as consistent items, with a daily special. 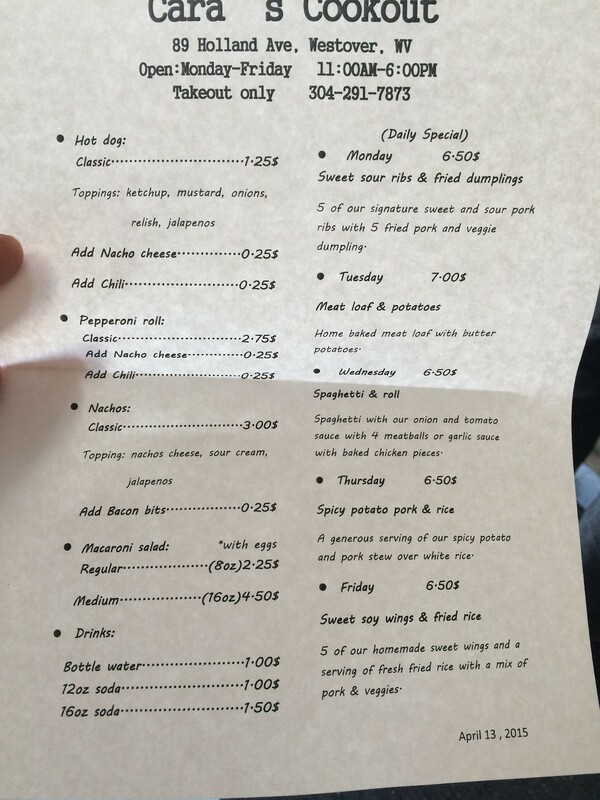 Monday is sweet and sour ribs with fried dumplings; Tuesday is meatloaf and mashed potatoes; Wednesday is spaghetti and a roll; Thursday is spicy potato pork and rice; and Friday is sweet soy wings and fried rice. 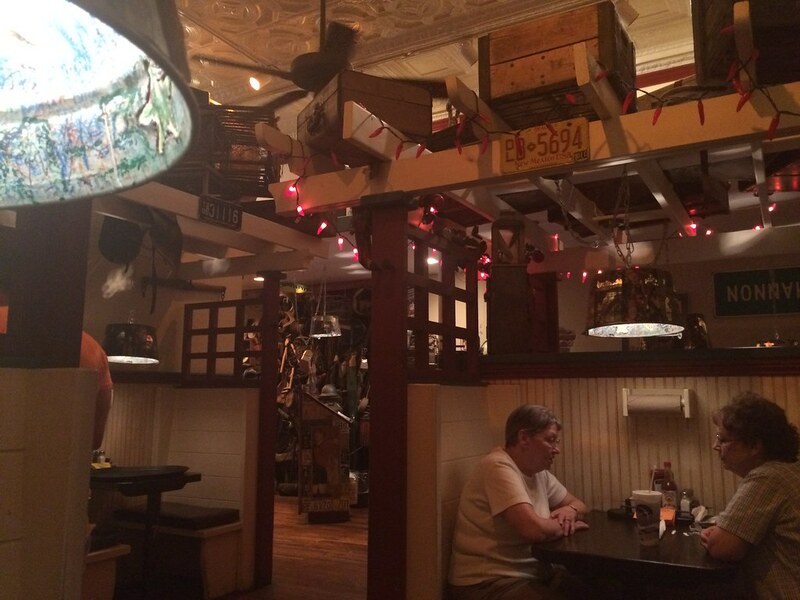 So, there's some Asian influence, some Italian, some straight Americana. When we headed to the restaurant to order, I asked why the variety in food, and the owner said that's just what they're good at making. I actually like the idea of doing a few dishes but just doing them well. 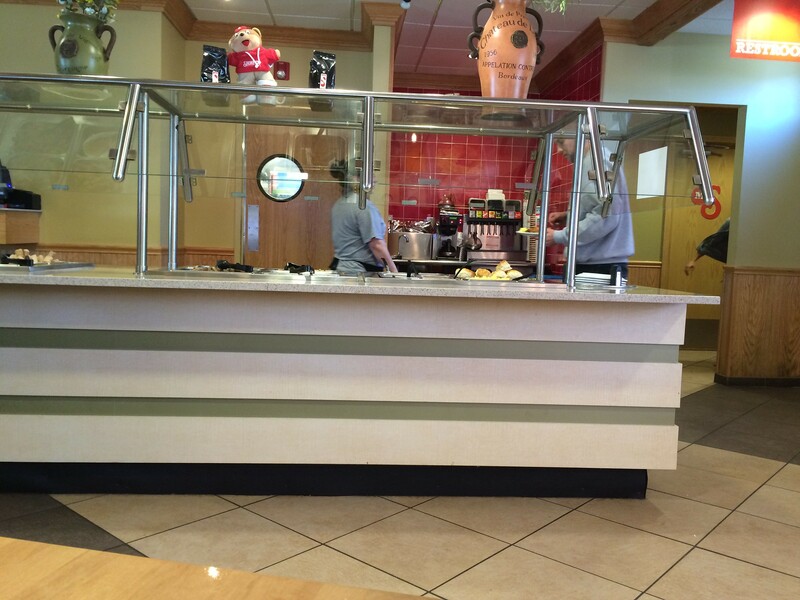 The wife is Chinese, and she seems to wrangle the kitchen, while the husband operated the ordering and cash handling. The couple apparently uses the upstairs for their kitchen and the downstairs is where they have the food prepped and ready to go for takeout. 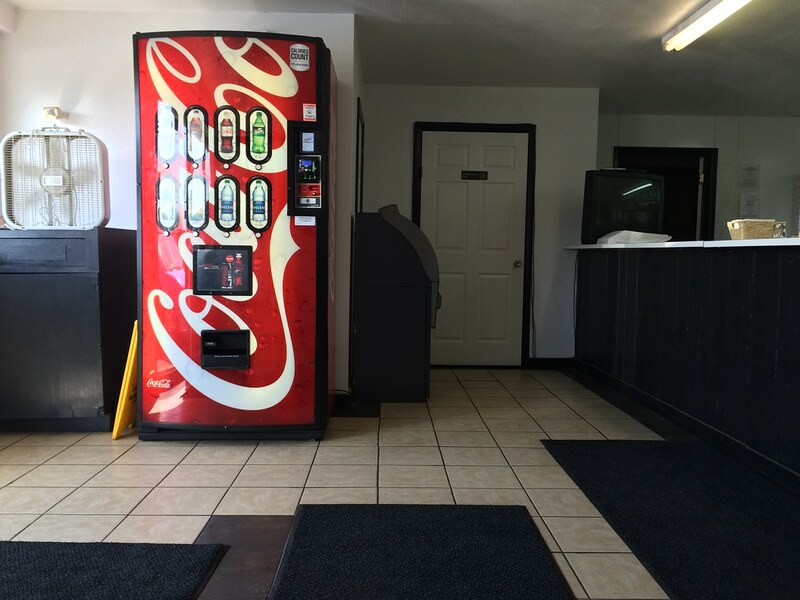 There are only two stools or so to wait for your order, and there really is no seating to eat inside. So, definitely make sure you have plans to take your food somewhere. 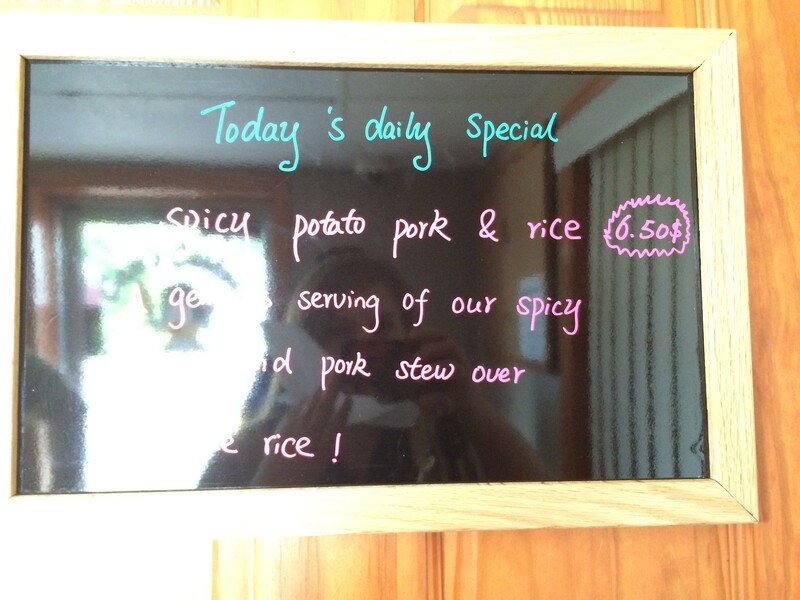 We happened to go on a Thursday for the spicy potato pork and rice. We were told this is actually one of their better sellers, so we were excited. Once we got back to the office, we opened our styrofoam containers. It doesn't really have much curb appeal - it kind of looks like a mush of sorts. 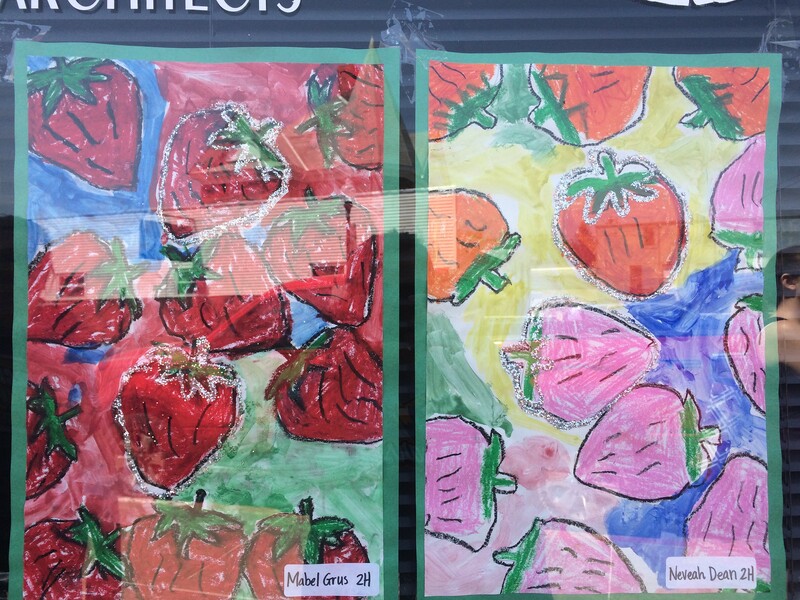 Maybe some fresh peppers or something would help give it some color. 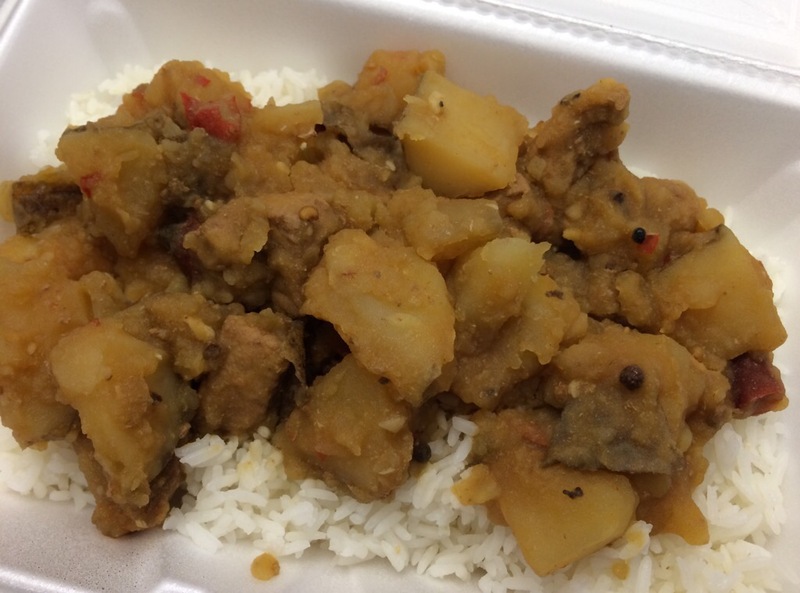 There were giant chunks of potato and pork in a slightly spicy almost curry. But it was just a bit one note for me. I wish there was a bit more dimension so it's not all the same mush texture and flavor - peppers? a sweet note? A sour note? Something? It wasn't bad ... I just wish there was more to it.